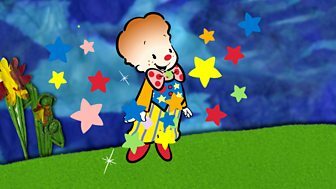 Tiny Tumble is an art based animation with makaton signing, featuring Mr Tumble alongside a tiny animated character, Tiny Tumble. 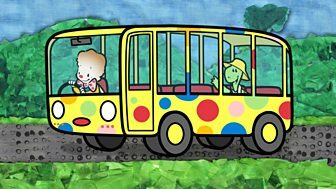 Tiny can draw to solve a problem - he enters into a child's picture and the adventure begins. Animation. Tiny Tumble discovers a beautiful garden but the flowers are very floppy. They need a drink but they don't seem interested in milkshake! Animation. 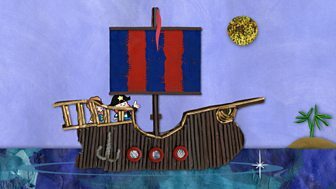 Tiny Tumble meets a pirate who is stuck in the middle of the sea because there is no wind to fill the sails of his ship. Animation. 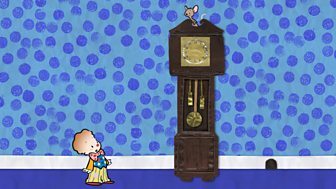 The clock from Hickory Dickory Dock has broken and not struck one, leaving the poor mouse stuck at the top. Animation. 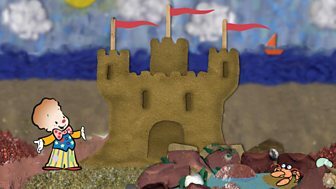 Tiny Tumble jumps into a seaside painting and meets a hermit crab who's grown too big for his shell and needs a new home. Animation. 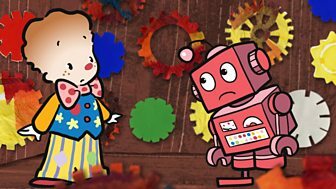 Tiny Tumble meets a robot who wants to dance with his friends but he can't move. Animation. 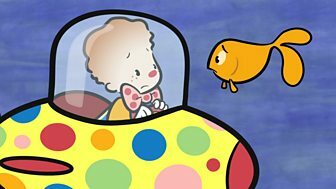 Tiny Tumble meets a very sad and lonely fish - but will lots of toys cheer the fish up or would a new friend to play with be better? Animation. 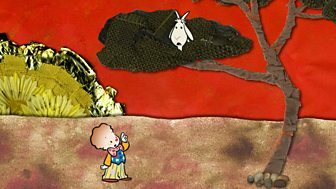 Tiny Tumble discovers a goat stuck up a tree. 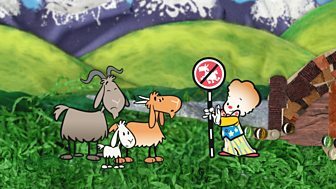 Will Tiny's trampoline really help get the goat down or does he need a little help from Justin and friends? Animation. 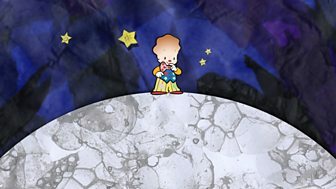 Tiny Tumble jumps into a painting of the moon and meets the cow from Hey Diddle Diddle. Animation. 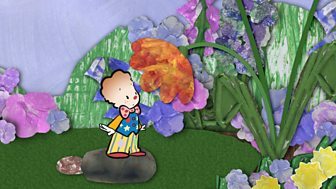 Tiny Tumble finds himself on a cloud in search of a rainbow. He meets an elf who has run out of rainbow colours. Animation. 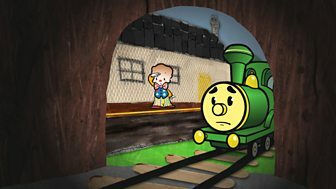 Tiny Tumble meets a little train too frightened to go through a dark tunnel. Can Justin and friends help to light up the tunnel? Animation. Tiny Tumble arrives in a prehistoric land and finds Dave the Disco Dino stuck in the mud. Can Tiny help get him back doing his groovy disco dance moves? Animation. Tiny Tumble jumps into a picture of a party but it's very quiet. 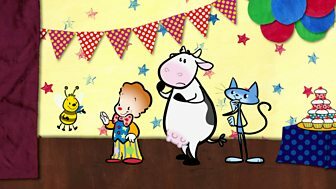 His friend the cat explains that there isn't any music because the cow sat on his fiddle. Animation. 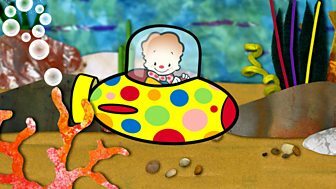 Tiny Tumble jumps into a picture of an underwater paradise! There he finds a sweet little octopus called Coral who wants to play in a band. Animation. Tiny Tumble meets a sad fairy who can't fly because her wand is broken. 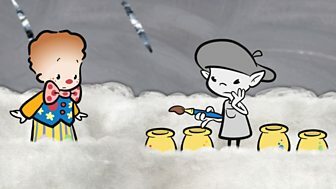 Can Tiny and friends help the fairy to fly again? Animation. 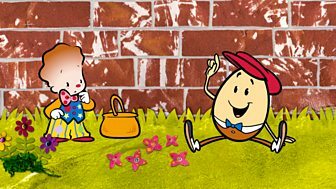 Tiny meets Humpty Dumpty, who keeps falling off his wall. Can Tiny draw something to help him get down easily or can Justin and friends help? Animation. Tumble meets Tortoise who is on his way to Hare's party, but being so slow, he's very late. Animation. Tiny jumps into a picture of a night sky and discovers a lonely star. 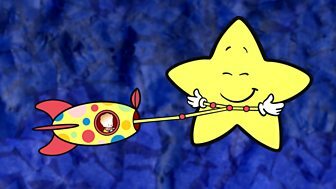 Can Tiny Tumble help to find the star's friends? Animation. 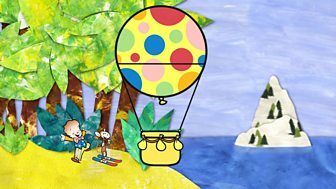 Tiny Tumble meets a monkey who lives on a sunny island but wants to go skiing on a far away snowy island. Can Tiny help Monkey reach the other island? Animation. A grumpy troll can't sleep because of the noise the goats make as they trip trap across his bridge. Can Tiny draw a way to help the Troll get some sleep? Animation. 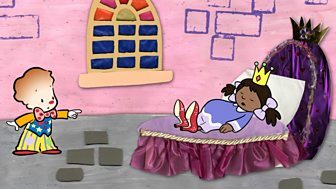 Tiny Tumble jumps into a picture to find a princess fast asleep. He does everything he can to try and wake her but can't. Can Justin and friends help?